Sports Reporter Chip Brierre is now working at WJLA-TV in a temporary position. He's open to any news OR sports job. He's an engaging, energetic professional with a charismatic and confident on-air demeanor. A top-notch storyteller, Chip is also an experienced play-by-play announcer. If you need a person of substance who viewers find comfortable and credible, look no further! Please take a look! See all of Chip's clips. 2016 AP Outstanding Sports Operations, large market. 2015 AP Best Sports Anchor, large market. 2015 VA Assoc. of Broadcasters Award for outstanding sports coverage. 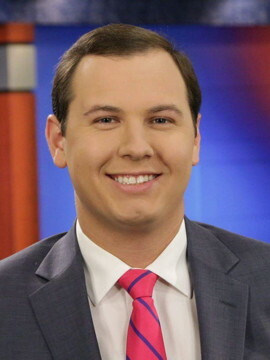 WJLA-TV, Washington: Sports Reporter, Temp (April 2019 - present). WRIC-TV, Richmond: Sports Anchor/Reporter (June 2014 - July 2018). Broke story on VCU head coach Shaka Smart leaving to take Texas head coaching job.Award-winning coverage of 2015 & 2016 NCAA Tournament runs for the Virginia Cavaliers. Exclusive coverage of VCU Baseball’s historic NCAA Super Regional in Miami. Anchor/produced top-rated weekly local high school football and basketball shows. Assisted in procuring lucrative sponsorships such as Papa John’s, Ford Automotive, Haley Auto Group. Voted area’s best local sports anchor by Richmond Magazine (2015, 2016, 2017). UMTV, Miami: Anchor/Reporter (Fall 2010 – April 2014). Anchored and produced weekly, live, award-winning, 30-minute collegiate sports broadcast. Anchor, reporter, analyst, staff writer and segment producer. Covered breaking news, shot games, practices and stories. Led coverage of Nevin Shapiro scandal. Insider access to Miami Hurricanes athletics through developed relationship leading to exclusive content. WVUM, University of Miami Radio: PBP and Host (Sept. 2010 – 2014). Play-by-Play and Color Commentary for five different sports. Host “Ibis Sports Weekly” and “Hurricane Sports Weekend”, hour-long, all-sports, call-in shows. WFOR-TV, Miami: Sports Department Intern (Jan. 2012 - July 2012). University of Miami, Coral Gables: Bachelor of Science in Journalism. Sony HD and XDCAM cameras, Panasonic HMC cameras, Final Cut Pro, Avid, Edius, NewsCutter, ENPS, iNEWS, CoolEdit Pro, Adobe Edit, Microsoft Office and Excel. Control room audio board, digital playback and graphics production. Mike Vrabel (former supervisor), Asst. News Director, WRIC-TV, Richmond, 804-330-8838. Catherine Shelor (former supervisor), EP, WRIC-TV, Richmond, 804-330-8811. Juan Conde (colleague), Anchor, WRIC-TV, Richmond, 804-330-8822.